Read parts one and two of this series. Treatment resulted in a subtle but significant improvement to the picture’s appearance. Greater contrast between the dark colors in the background and the pastel “petals” in the foreground returns a sense of vibrancy and movement to the composition. In addition, although they remain inherently fragile, consolidation left the paint layers more stable–improving the overall condition of the picture. 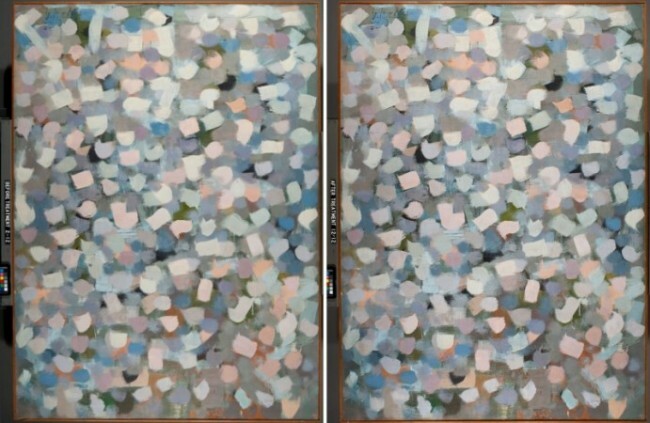 Left: The back of the painting showing the canvas and stretcher. 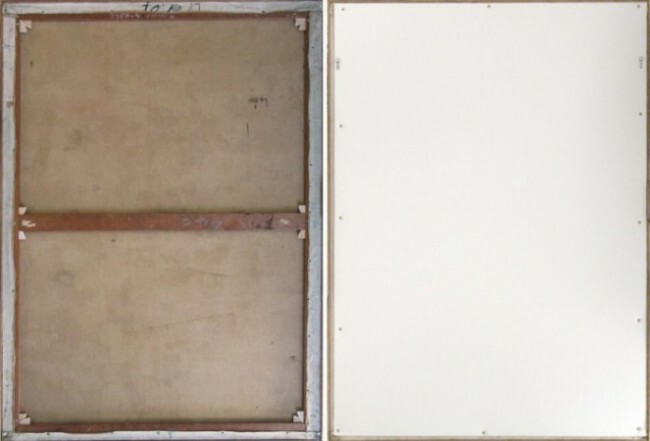 Right: The back of the painting with a protective foam-core backing, attached to the stretcher to add support and protect the back of the canvas from dust and blows. well done but foam-core backing is not advised for permanent use. consider corrugated polycarbonate – its rigid, light, does not sag and does not emit VOCs. Thanks very much for your comment. I should clarify that we used foam board with an inert foam interior and an acid-free, buffered paper exterior. We do use corrugated polycarbonate on occasion as well, for all the reasons you mention.